The Akathist Hymn, which is chanted on the Fifth Friday of Great Lent, remotely reminds us of the reverence of our people for the person of the Panagia. It further reminds us of the salvific intervention of the Theotokos in the Queen of Cities, when in 626 the Avars and the Persians attempted to occupy Constantinople, as well as her continuous miraculous interventions in difficult times. We would not sing hymns to the Panagia, if the Son and Word of God was not incarnated in her all-immaculate womb. She is not only the mother of Christ, but at the same time our own mother. She offered us the greatest gift, the Savior of our souls. And her Son and God gave her the greatest gift, by taking human nature from her, divinizing and renewing it. This is why in the Christmas Service we chant: "God has appeared to mankind from the Virgin, taking our likeness and deifying our nature." The Panagia is the foremost creation of the love of God. No one can approach God, except through her and the Mediator born from her. And none of the gifts of God can be given to angels or people, except through her. This is why in a famous homily of Saint Gregory Palamas, he calls her "the steward of the treasury of divine gifts and their vault, and this, not in order to keep them for yourself, but so that you might make created nature replete with grace. Indeed, the steward of those inexhaustible treasuries watches over them so that the riches may be dispensed; and what could confine that wealth which wanes not?" This is because she lent her flesh to the Son and Word of God, held Him in her arms, and nourished Him with her milk. This is why she has what is more precious than we have as people in heaven, where she continues the work of interceding and mediating near her Son and God. Very aptly, therefore, the sacred hymnographer in the Salutations Service calls her "incense of intercession". Incense of Intercession. The Lady Theotokos is the all-pure altar, where the Only-Begotten Son rests through the Sacred Mysteries. She is the link between heaven and earth. She stands between people, who offer rational worship, and God, who accepts this offering. From Christ, the head of the body of the Church, springs forth every perfect gift. And through the Mother of God, who is the neck of the body, the divine gift reaches the faithful, the members of the body. The mother of Jesus, "who directly bears the head, Christ, is the mediator of the head and the body of the Church. And somehow she connects the two like a neck. Thus, this sacred neck, the Panagia, is another path, the only one that leads to the head of all, Christ." Incense of Intercession. 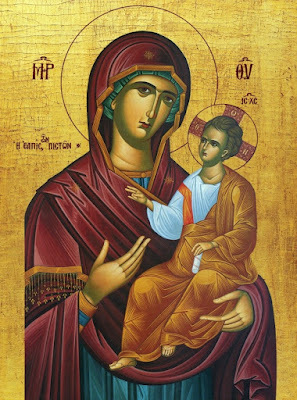 Since the Panagia holds a central place in the Mystery of the Divine Economy, she also holds a very central position in Heaven, near to her Son and God, as King David prophesied: "The Queen stands at Your right hand, arrayed in gold." She is the joy and blessing of all creation. She is the preaching of the Prophets, the glory of the Apostles, the boast of the Martyrs, and the renewal of those born on earth. She is the mother of the essence of joy and blessing. John the Damascene writes: "You are the unending gladness of the Patriarchs, unspeakable joy of the Righteous, endless jubilation of the Prophets. You bless the world, and sanctify all of creation." This is why our Orthodox Church believes in the mediation and intercession of the Panagia. "She is not considered another mediator like Christ the Mediator, but she is the mediator to Christ, the only Mediator of mankind." Incense of Intercession. If the mediations and intercessions of the Saints and Righteous is powerful before the throne of God, how much more powerful is the intercession of she who gave birth to the Maker of all? Her place in the Kingdom of Heaven is so great, that Saint Andrew the Bishop of Crete says: "She is God after God, second to the Trinity." How, therefore, can her prayers and entreaties not have great power? Her protection and fervent intercession is an incomparable wall and refuge for the world. She covers over the needs and troubles of mankind. The wonderworking grace of the Panagia is spread out everywhere. It is only necessary for people to ask for her wondrous intervention. Not only in this life, but when we depart for the future life, we will receive her help. How movingly we are reminded of this truth by the composer of the prayer to the Panagia during the Compline Service: "At the hour of my death, care for my miserable soul and drive the dark faces of evil spirits far from it. On the awesome day of judgment, save me from eternal punishment and make me an inheritor of the ineffable glory of your Son, our God." In the song, therefore, of this Akathist Hymn, which is a minimal offering of man to the all-revered person of the Panagia, we only need to offer our tears of gratitude, our respect and reverence as well as our request, that she may intercede to her Son and God. May this incense of intercession cover us at every moment of our lives, and with this may we leave this world for eternity, and may it accompany us on the terrible day of judgement. Amen.